Everton and Tottenham are both aspiring to play Champions League football next season and along with Liverpool, and perhaps Manchester United, are the only credible challengers for a top-four finish behind the three teams already highly likely to finish inside the top four: Arsenal, Manchester City and Chelsea. This weekend’s fixtures are particularly interesting then, not only pairing Liverpool and Arsenal at Anfield on Saturday, but in Everton’s trip to Tottenham on Sunday. Tottenham are one of the seven clubs who have conceded more PL goals in front of their own fans this season than they have scored. In contrast, their away form of eight wins, two draws and two defeats is second only to Arsenal’s, and then only on goal difference. So where is the solace? Tottenham have earned more points at home from Everton in the Premier League than they have won against any other team, or 42 from 21 previous seasons to be precise. Everton have only won there three times in 21 visits. 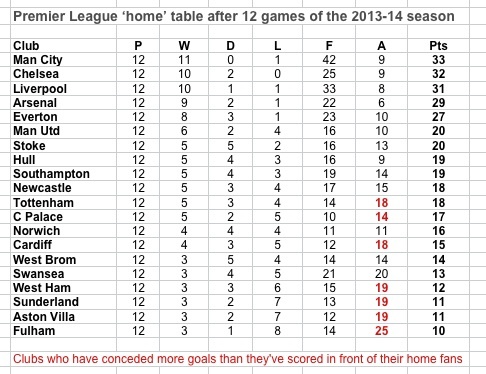 Here is Tottenham’s complete home record by opponent, which also shows that Tottenham have managed two or more points per game against several other long-term Premier League rivals including Manchester City. 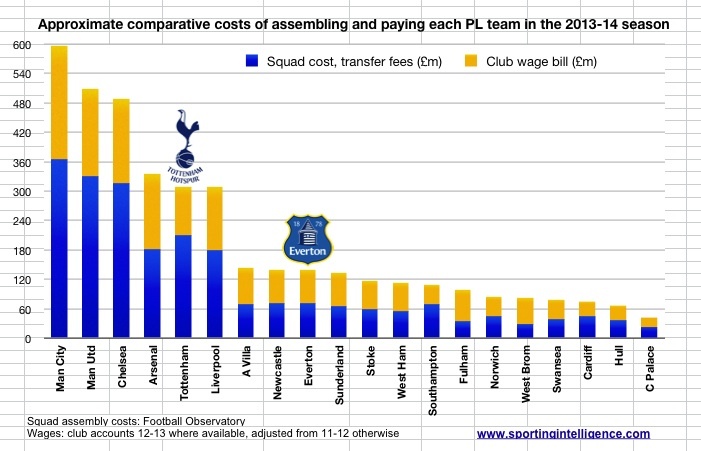 But which of the clubs, Tottenham or Everton, are punching most above their weight in terms of financial resources? Today’s final graph makes that abundantly clear: Everton. But look at which club should, economically, be fifth: Spurs. And where ‘should’ Everton be? Probably around mid-table, scrapping it out with Villa, Newcastle and Sunderland. Is the recession levelling the Premier League playing field?